Co-inventor Dr. Anne A. Madden talks about the future of flavor and the story of Wasp Beer. CBS News Hour features the story of Wasp Beer and the research behind it at North Carolina State University. Tools of Science interviews Co-inventor Dr. Anne A. Madden on the research behind finding new yeasts for new flavors. Listen to Dr. 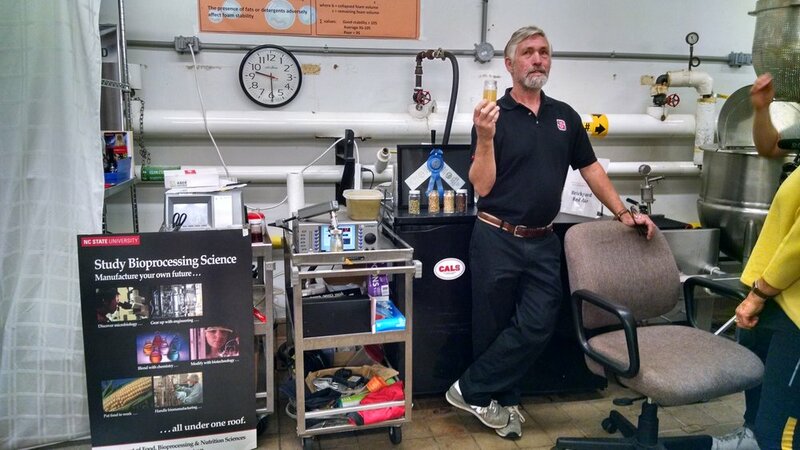 Rob Dunn and Dr. John Sheppard of North Carolina State University talk about the research that led to using yeasts from insects for beer. PBS Gross Science talks about the research behind Wasp Beer and how yeast from insects aren't actually that gross. Bumble Bee beer with the PBS news crew during filming. These yeast were born from wasps, such as those above. Bumble Bee Beer made with Lachancea's yeast featured at a recent North Carolina State University Event. The many forms of new yeast that provide new flavors. An early fan of Wasp Beer, made from Lachancea's yeast. Co-inventor Dr. Anne A. Madden looking at samples in the lab. Wasp Beer debuting at the World Beer Festival in Raleigh, N.C.
Co-inventor Dr. John Sheppard discussing the story of Wasp Beer with a documentary film crew. Wasps collected from the field. New yeasts from insects for better beer flavors. A microscopic view of some of the yeast behind Wasp Beer.